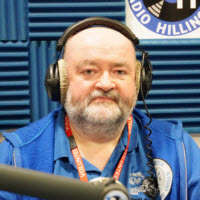 I was introduced to Radio Hillingdon in 2010 by another member of the station, Joe Howlett. I wanted to give a little back by visiting the patients on the wards and hopefully entertaining them with my choice of music during my show. I love to do my radio show and I enjoy the fundraising side of being a volunteer. We do many road shows during the summer months like visiting School Fetes and Village Fayres. I also enjoy helping to collect money for the station at local supermarkets. I present the Monday Night Late Show from 10pm till midnight. I have Trevs triple play which is 3 number 1’s back to back. But from what year? I also have a mellow 3 in a row after half past 11. You can also hear me covering for people when they are on holiday.